Farnborough 2016 marked the first appearance of Leonardo, the new One Company born from Finmeccanica which new name was announced last May. 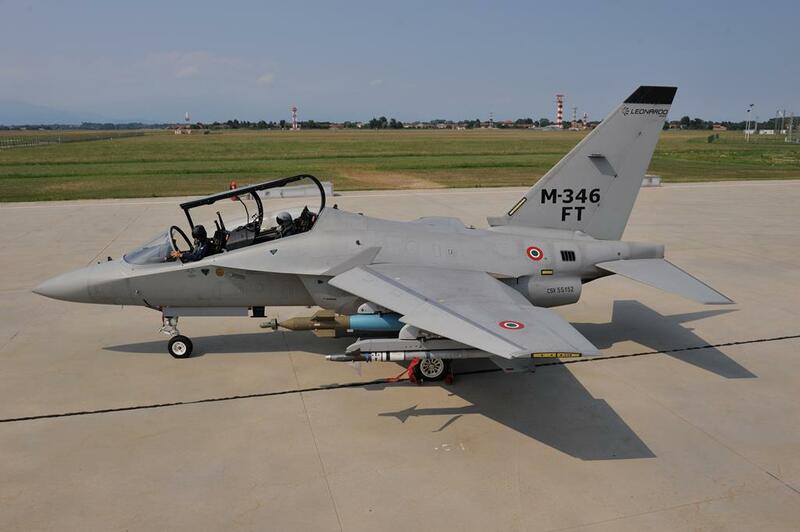 Prior the FIAS opening Leonardo detailed the evolution of its M-346 from AJT (Advanced Jet Trainer) into FT (Fighter Trainer). thus relatively simple. Leonardo depicted six different configurations: Ground Attack, with two laser-guided bombs, two external tanks and a targeting pod, a similar version but with no tanks and two SRAAM missiles, radius of action being decreased from 350 to 155 NM; Homeland Security, with SRAAMs, tanks and a gun pod on the ventral hard point providing a 30 minutes of patrol at 380 NM plus 30 minutes of intercept run; Tactical Reconnaissance, with SRAAMS, tanks and recce pod and a 425 NM radius of action; and two Ground Attack configurations, one with SDBs, tanks and targeting pod with around 380 NM radius of action, and one with SRAAMs, JDAMs and one tank on the ventral hard point, with 260 NM radius of action. The M346 is also the flight segment of Raytheon’s – Leonardo’s proposal to the US for the T-X programme. 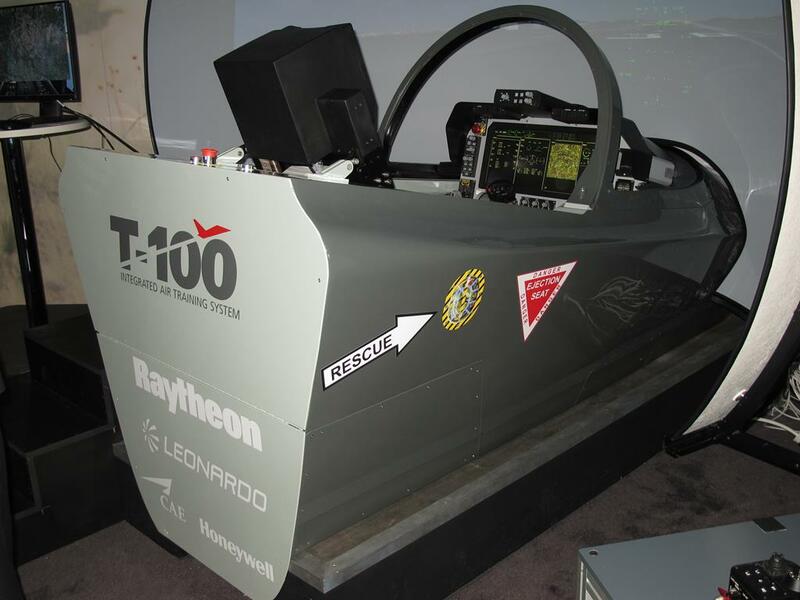 Known as T-100, a mock-up was visible at Leonardo’s static area while a full mission simulator was at the Raytheon’s chalet, already fitted with the large area display which is part of USAF’s requirements. 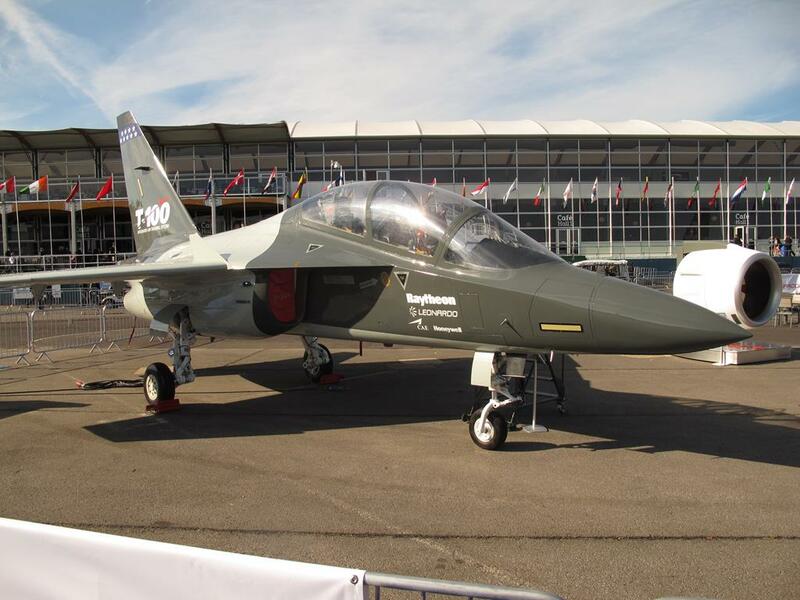 An RfP for the T-X was awaited just after FIAS, selection being forecasted for 2017. 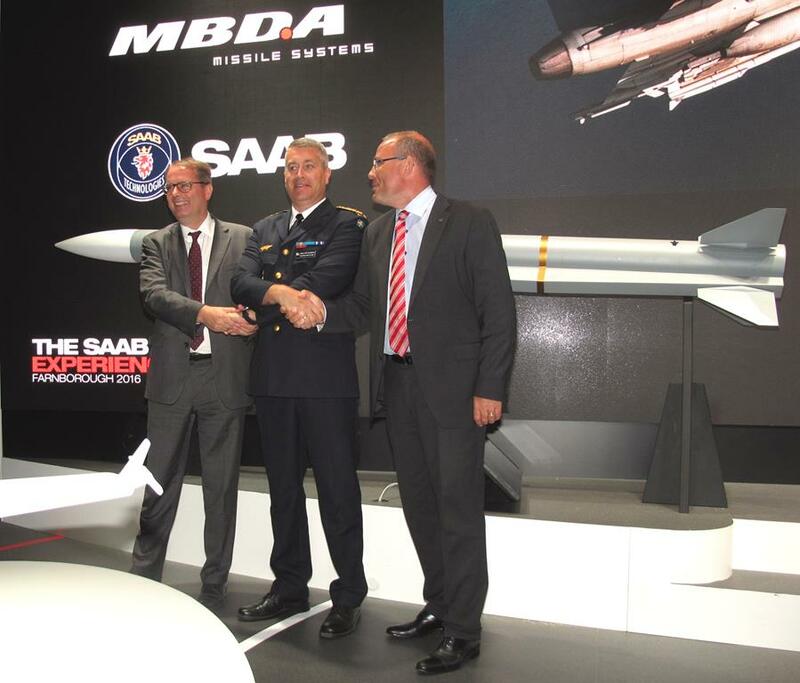 Remaining in the fixed wing domain, the Gripen has become the first operational user of MBDA’s Meteor. Between April and June 2016 all six Swedish Air Force squadrons have received their Gripen C/Ds with the MS20 upgrade which includes among other improvements to the radar system and the integration of the Meteor. 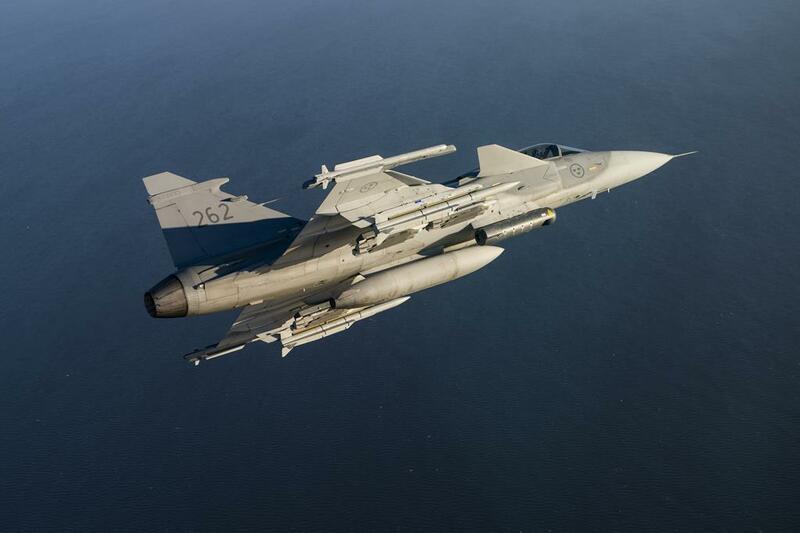 “With the Meteor and the IRIS-T Swedish Gripens deploy the most lethal mix of air-to-air missiles,” Maj.Gen. 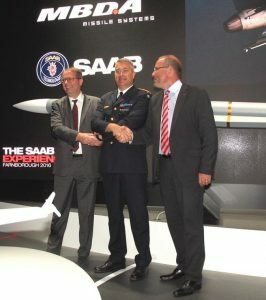 Mats Hegesson stated at the ceremony marking what is in fact the Initial Operational capability of the new missile. 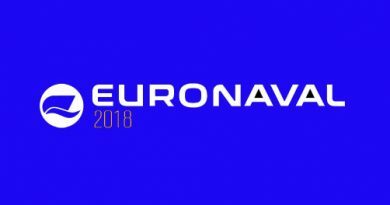 “The Meteor is a missile with the range of a Phenix and with the accuracy of the AMRAAM,” Gen. Hegesson added, explaining that the Full Operational Capability will be reached in late 2017, ealy 2018, when all new tactics allowed by the new missile will be developed and evaluated, and when all due exercises will have been conducted. 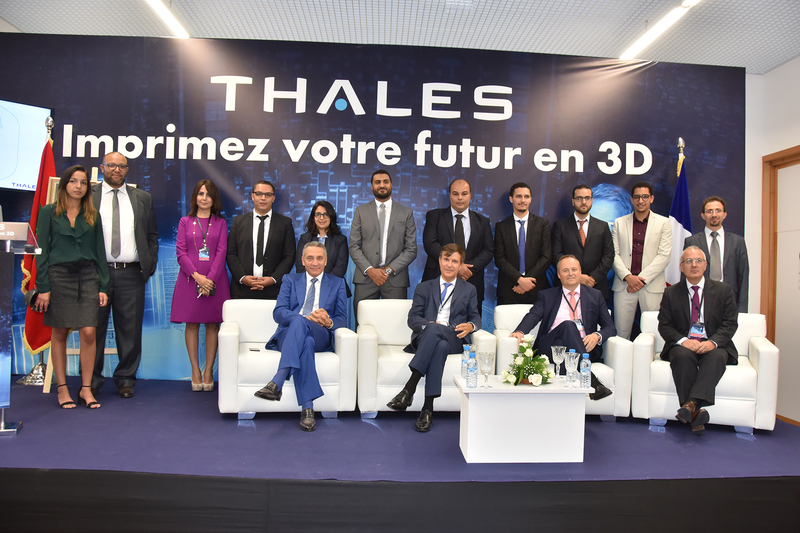 The ceremony was attended by Antoine Bouvier, MBDA CEO, and by Håkan Busche, Saab CEO. The Meteor was not the only MBDA product to become operational: the European missile company announced that the latest iteration of its Brimstone, dubbed Brimstone 2, entered service with the Royal Air Force in May 2016. The weapon answers the SPEAR Capability 2 requirement and compared to the original weapon features an insensitive Munition compliant rocket motor and warhead, an enhanced version of MBDA’s Dual Mode Semi-Active Laser/ Millimetric Wave seeker, an enhanced autopilot as well as a significantly increased weapon envelope, in terms of off-axis and maximum range. 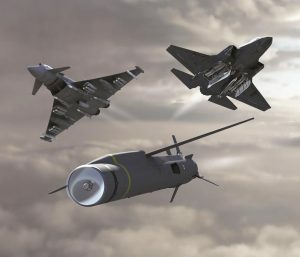 The new version has has formally entered service on the RAF’s Tornado GR4, the aim being that of deploying the Brimstone 2 on the Typhoon, RPAS (the UK announced the selection of General Atomics’ Certifiable Predator B), as well as on the AH-64E, which acquisition was also announced at FIAS. 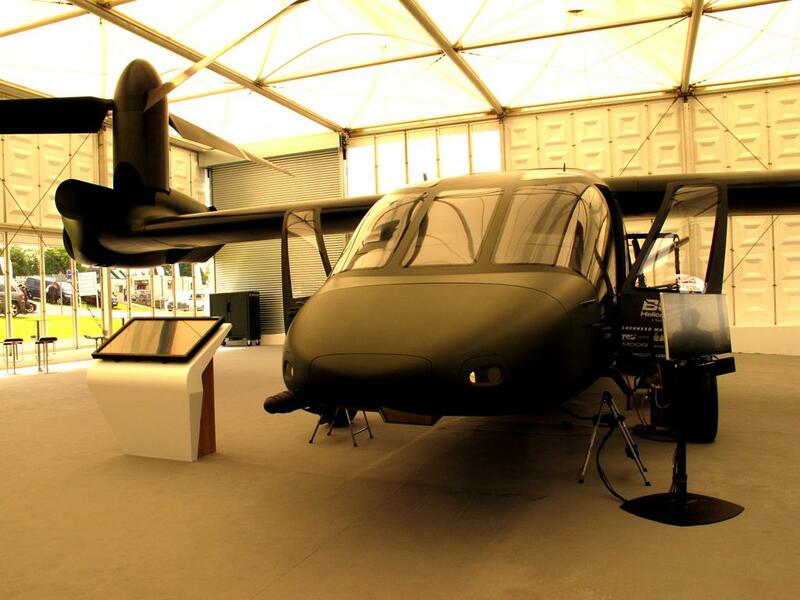 The first launch from such a platform from an M299 launcher was also announced at the show. Last but not least comes the SPEAR which has been designed to cope with the SPEAR Capability 3 requirement. The aim of MBDA’s engineers was since the inception to develop a weapon capable to fit into the F-35 weapons bay. What deeply makes the SPEAR a game changer is the fact that it is powered all along its trajectory by a Pratt & Whitney TJ-150-3 turbojet, the system making sure that at the end of its flight it retains sufficient fuel to make the required manoeuvres to hit the target at the right angle of impact. With over 100 km range, the SPEAR is fitted with a multimode seeker that is a derivative of the one used on Brimstone, which ensure maximum accuracy. It allows to compare what the missile is seeing with what the launch platform is seeing, and eventually with what is seen from an observer on the ground, increasing accuracy even in very complex scenarios. Another key element is the multi-effects warhead, produced by TDW, the MBDA warhead company based in Schrobenhausen, Germany. It is made of tandem shaped charges, the first one fitted with a pre-fragmented outer body, which also deals with ERA, the second being the penetration one. As for the launch mode, for the F-35 MBDA developed a four-pack launcher which allows an F-35 to carry eight SPEAR in the weapons bay, eight more being carried outside if needed. 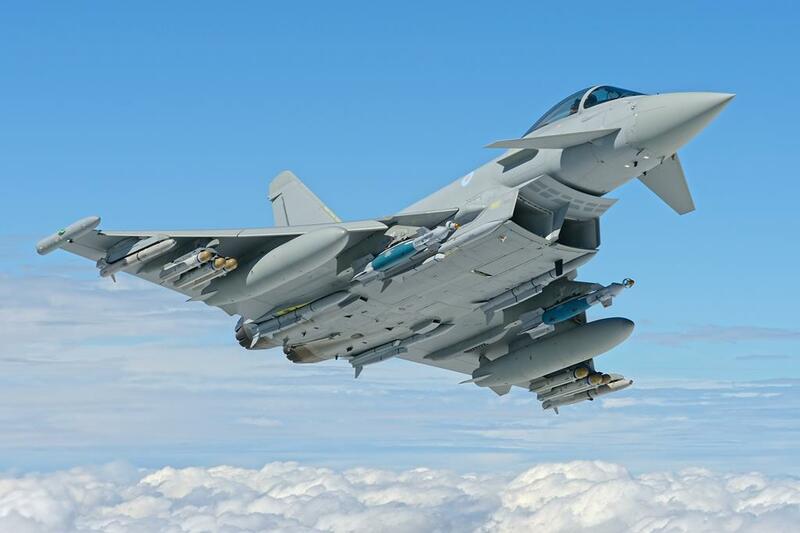 As for the Typhoon a 3 pack launcher is used, a very close derivative of the system used for Brimstones. 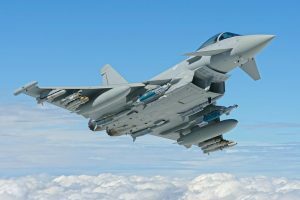 In March 2016 the SPEAR has been launched for the first time from a Typhoon, and the four-year development contract worth £ 411 million signed in May will allow bringing the SPEAR close to production in 2020. Coming to rotary wing airframes, the most interesting one was probably not a real one but a mock-up, that of Bell Textron V-280 Valor. This third-generation tilt-rotor aims at replacing not only the UH-60 Blackhawk but also the AH-64 Apache. 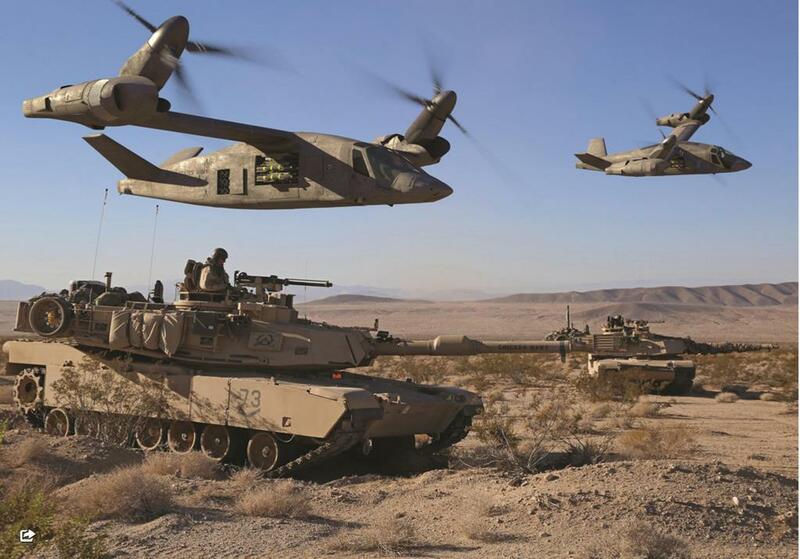 With only its rotors tilting and with a lower rotor disk load compared to the V-22 Osprey, 78 kg/m2 versus 107 kg/m2, the Valor should behave better when operating from difficult surfaces such as the desert, reducing brown out risks. As it does not feature a rear ramp, its rear tricycle landing gear allows to free the chin area to install sensors and weapons, a cannon being installed on the right side at the front, with a maximum calibre of 30 mm. As for the attack version, viewgraphs were showing interesting solutions such as rotary missile launchers bringing two weapons per side in the ready to fire position close to the fuselage, to avoid interferences with the rotor disk, when this acts as a propeller; a total of 16 missiles is forecasted. In the rear nine common launch tubes per side capable of launching precision guided munitions. The model of a naval version was also on the stand, fitted with an anhedral tail to allow the rotation of the wing over the fuselage; together with the automatic blade folding system this allows to minimise the Valor footprint on the deck and in the hangar. Bell Textron officials forecast an increase in dry weight of 12% due to the rotating and folding system. With the fuselage and wing assembly already finished, the company aims at integrating engines and transmissions in April 2017, the first flight being forecasted in September 2017, to demonstrate the “twice the speed, twice the range” motto. 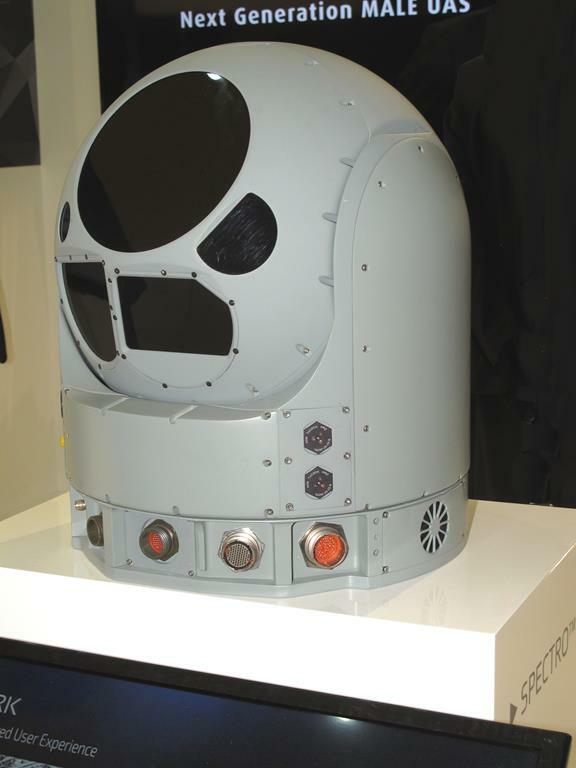 In the sensors field, Elbit Systems unveiled its Spectro XR, a 52 kg 15” payload which, according to the company, packs the payload performances of a 20” gimbal as it can host up to nine sensors. The daylight channel is based on a 1920×1080 pix colour CMOS sensor and is fitted with two spotter lenses, one with 0.36° and one with 0.72° FoV, and with one 25° to 2.4° continuous zoom. It operates also in the near-IR, providing black and white images in low light conditions. The medium wave IR thermal channel is provided by an HD 1280×1024 pix sensor with a 1° spotter lens and a 3,7° a 25° continuous zoom. A short wave IR is also available, in the 1,2-1,7 µm band; while for the MWIR cheaper options are available in the form of smaller sensors, here Elbit Systems proposes a 640×512 pix focal plane array but as option a 1280×1024 HD one can be provided, the lens providing two FoVs, 0,25° e 0,57°. Elbit developed system allowing to fuse together the images originated by the various sensors, providing the user with an optimised picture depending on the scenario conditions; it can work automatically, reducing the operator’s payload, or be operator driven. The gimbal can also host a number of laser subsystems, among which a designator, a rangefinder, an illuminator and a pointer. All target data provided can be injected in the picture, together with virtual reality elements. A GPS-GLONASS-Galileo navigation system is also included in the Gimbal. Elbit Systems declares a 10 µrad stabilisation for rotary wing and a 3 µrad one for fixed wing aircraft. The system can track up to five targets at the same time. Currently in the qualification phase, the Spectro XR has already bagged two launch customers and will become fully operational in Fall 2016. 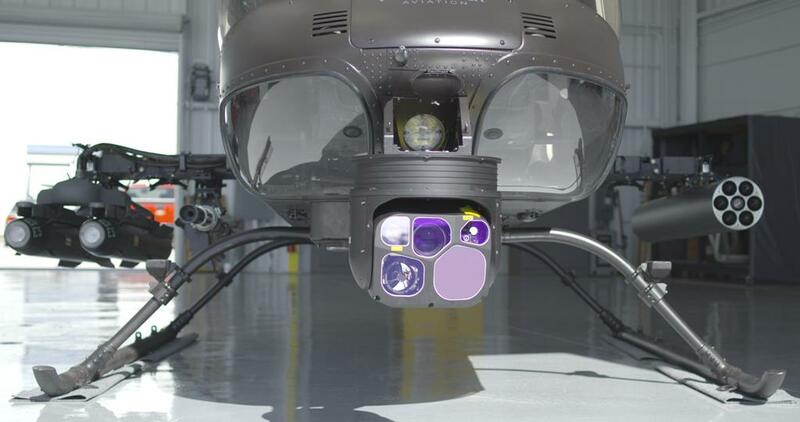 An even lighter option is proposed by FLIR, which StarSafire 380-HDc, where “c” stands for “compact”, was unveiled a couple of years ago, and now is complemented by the StarSafire 380-HLDc, the added “L” standing for “laser”. This new gimbal is more oriented towards targeting, thus the day camera continuous zoom payload was removed to make space available for the laser designator. As identification range performance is critical to targeting, the shorter range colour zoom payload fitted in the standard 380HDc was removed while a longer range colour step-zoom spotter payload for maximum long range ID performance was installed, the spotter having three times more focal length than the zoom and essentially two to three times its range performance. Laser designator, rangefinder, pointer and laser warning receiver can be installed; the latter allows to pick-up a maximum of 10 laser signals, showing designators codes, thus allowing to understand the overall scenario and to pick-up the assigned target. All mechanical and electrical interfaces are the same of the non-laser gimbal, so they can be replaced easily in less than half an hour. The add-on systems increased the weight from 28 to 32 kg. First deliveries are scheduled for 2017, the system being already available for trials.